A good thing: FBS traffic control. Mrs Blog and I were buried WAY in the back of the parking lot and we were out in 5 minutes. We picked a friend up in Hadley and the Coolidge Bridge was backed up past the lights in the same town. Took us 20 minutes to get onto I91. The images from the game are not that great. Not much UMass action to focus on. I have a web album here. One thing may amuse you. Check out the holding in images 1946.jpg, 1965, 1968, 1970 and 1972. You probably can find others. Well, the nearly 250 mile round trip journey to East Hartford was interesting to say the least. The road was long and so was the game. First the bad, the UMass offense set probably historic lows in production. We had only 3 first downs against the Husky defense and didn't come close getting anything going in any phase of the game. We rushed 24 times for essentially zero yards. The noise seemed to bother the offense and they never got into any kind of rhythm. Special teams were also a sore spot. We had a punt blocked for a touchdown. UMass had trouble covering returns all night as UConn averaged 21.8 yards a return. The bright spot was the UMass defense. The DL played superb. UConn a power running team, averaged 3.4 yards a carry. The Huskies also ran the Wildcat nearly every series and went nowhere. The defense stayed with the offensive shifts. They also developed some pressure on passing plays. The Minutemen's defense gave up 23 points and were on the field all night ----- literally. If you were watching on TV, you probably couldn't see the players encouraging each other. Nobody quit. Keep the faith. We knew this was going to be a bad matchup for the rookie UMass offense. Official UMass writeup and box score. Matty V. has the Minutemen shut out in their FBS opener. He also has FBS football is finally here. Read the last sentence. Matty says QB competition is on-going. MassLive has three articles: the UMass offense couldn't get off the ground, the defense was better than the score indicated, it was a rough opener, but we're started. The Boston Herald said UMass was no match for UConn. They also had UConn roughly welcomes UMass. The Hartford Courant said welcome to the next level UMass. 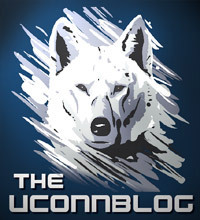 The UConn Blog has as good a start as we could ask for. The UMass Daily Collegian said UMass was blown out. The results for the rest of the MAC openers. Vanderbilt lost to South Carolina. Matty V looks back at the start of an old era and his first story as the UMass beat reporter. I vividly remember that UMass-Delaware game. WHMP's 2.5 watt nighttime signal did not reach beyond Whately, so I drove down the the VA hospital in Northampton and parked in one of their lots. I bought a Coke from one of the vending machines in the deserted lower floor of the main building , then went back to my truck , opened all the windows to let the evening air in, tilted the seat back and listened to Todd Bankhead, Adrian Zullo, Kerry Taylor and Marcel Shipp tear up and down the field at Delaware. The moment was a sea change. 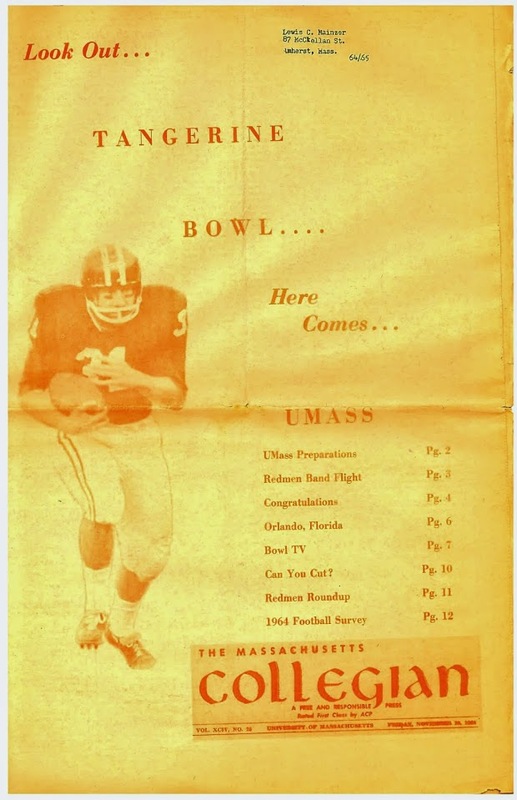 The Hens had always dominated UMass and it was no secret why. Delaware was fully funded with 63 scholarships. Jimmie Reid and Bob Pickett got low 50's ---- and sometimes less. The Hens regularly took 1-A transfers, we did not. Delaware drew 20,000+ and the school administration was serious about winning. At UMass, winning had been a low priority. Matty has the results for the initial game of UMass coaches going back to Jimmie Reid. He also has UMass and UConn are ready for the kickoff of their respective seasons. I'm part of the Media Vs Bloggers weekly football picking contest at the Gazette. The other half of the question-and-answer session I had with the UConn Blog is up on The UConn Blog's site. The game is on ESPN3. However UMass fans in Connecticut and New York City are blacked out. The game will also be on SNY. The Hartford Courant has UMass ready for their 1-A adventure. 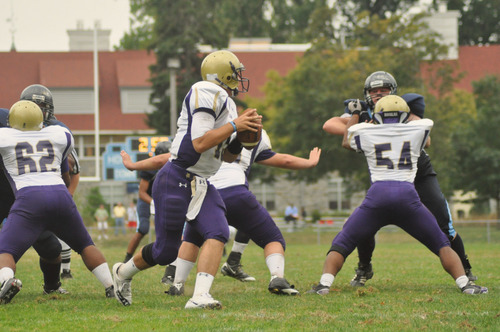 MassLive says the Minutemen are not alone with starting a new quarterback. The Boston Herald says UMass renews an old rivalry. The Boston Globe says UMass and UConn start up again. The Hartford Courant states the Huskies want a strong start against UMass. The Courant also has five things about tonight UMass-UConn game. Harry Plumer of MassLive runs UMass-UConn on NCAA13 and gets a 38-7 Husky victory. The UConn student newspaper says UConn is ready to rumble. The Boston Globe previews the MAC conference. Vandalay Sports has the Huskies by 37-16. The following is a question-and-answer session with Andrew Porter who owns the excellent The UConn Blog. 1. I've made a number of trips to the old Memorial Stadium in Storrs. Tell us about Gameday at Rentschler. I don't think many UMass fans have been there. The UMass band is going to make the trip. What's the Husky band like these days? The Rentschler experience can be a mixed bag. On one hand the lack of an on-campus stadium can cut down on atmosphere. On the other, the location is nice for anyone driving and access in and out is about as easy as you can get for a big stadium. The tailgating setup is nice too with a repurposed airport used as the grounds. The stadium itself is less than a decade old and sightlines are good from wherever you sit. As for the band, here's their preview for the year. 2. Last year UConn struggled to throw the ball. Do you expect the passing game to be better or can the Huskies ride Lyle McCombs to a successful season? The passing game better get better if UConn wants to improve this season. Luckily, things seem to be headed in the right direction with transfer Chandler Whitmer replacing last season's starter (and current back-up) Johnny McEntee. Obviously Whitmer still has to prove himself against live competition, but all reports suggest he's a big step in the right direction. Either way McCombs is still going to be a handful for opposing defenses. 3. Don Brown. For UMass fans that's like hearing Wyatt Erp just road into town. I think the Huskie defense is about to become one of the top units in the Big East. What's your take on Brown's second year? I'm very excited about it. Brown's defense was the best part of watching UConn last year and his aggressive style really connected with the fans. There is a lot of experience on the defensive side of the ball as well -- look for corner Blidi Wreh-Wilson to be a big factor along with linebacker Sio Moore. Sophomore linebacker Yawin Smallwood also stands to have a big season. 4. Speaking of the Big East, do you think the league is stable now? What is your prediction for UConn's year? The league is stable.... until someone gets a better offer. I'm excited about Mike Aresco the league's new commissioner who has a TV background and is a UConn alum to boot. With that said if the Big XII came calling for Louisville or if the ACC found a way to give UConn an invite I'm sure either school would bolt in an instant. 5. Coach Pasqualoni has been saying good things about UMass. What's is your feeling about an annual series with the Minutemen? It would be a money maker for both schools. I have no objection to an annual series with UMass as long as your transition to the FBS goes well. UConn usually plays a MAC team anyway so the Minutemen would certainly fit on the schedule. If there is an issue I'd imagine it'd be with location -- those MAC games are usually played in East Hartford and I don't know how UConn would feel about travelling. 6. Tell us how think Thursday's game will go. I don't know if it will be a blowout or just a win for UConn, but I think it will certainly be one of the two. That's not a knock on UMass, just a recognition of the fact that your program is in a transition period. I hope you guys give us a good game. I imagine our defense will be stout either way, it really depends on what the offense can do. If Whitmer turns out to be effective in the offense I could see things getting ugly. 7. Good luck to the Huskies on the other eleven games on your schedule! UPDATE: I've swapped questions-and-answers with Andrew Porter, who is one of the owners of The UConn Blog . Andrew's responses to my questions will be up here as a separate blog post this afternoon. Matty V has a story on Thursday's game ---- the Minutemen's first FBS contest. UMass DB Mike Lee will not play against UConn, but after that he will be available. MassLive's Harry Plumber has a story about UMass filling in some details for UConn. The story mentioned the number of true freshmen in the two-deep chart. I counted 14 true freshmen or transfers in the two-deep. There's an old coaching saw that says you lose one game for every true freshman you start, so the Minutemen will be definitely building for the future in 2012. CBS Boston says Coach Molnar is excited, not pressured. SB Boston says the Minutemen are marching into unknown territory. The Boston Herald has two stories about the Minutemen: UMass tackles a new look schedule and a big step up for Coach Molnar and the Minutemen. The MAC Report Online says UMass is the MAC"s mystery men. The Journal-Inquirer says three's a crowd in New England. The Stamford Avocate states Coach Pasqualoni faced tough choices in naming the Huskies captains. UConn QB Chandler Whitmer is ready for his opptunity. The Hartford Courant says Don Brown's defense is ready to roll. The Examiner.com looks at the opening games in the MAC and says UConn will push UMass around for 60 minutes. One of the more interesting games in college football this week is Ohio against Penn State. The Bobcats are a pretty solid club. This should be a good gauge on how much the Nittany Lions have actually been affected by the NCAA sanctions. The Worcester Telegram says Giants-Patriots will be a battle of benches. James Ihedigbo gets a mention. The Times-Union has a story on Jeremy Horne getting cut by the Chiefs. UPDATE: UMass has its game notes for UConn up (.pdf). It includes a depth chart (page #7) and a numerical roster (pages #10-11). The roster and depth chart seem accurate. Matty V. says three true freshman will start for the Minutemen Thursday. Michael Boland will start at RG, Blake Lucas will kick and Tajae Sharpe will be one of the WR's. In addition, Freshman QB A.J. Doyle will not redshirt and will be the #2 QB this season. Matty also has a MAC conference preview. MassLive's Harry Plumer has an interesting story about how five teams (including UConn) did in their first year as FBS/I-A. UConn, you will recall, was not a very successful FCS team when they made the jump. If I remember right, they had made only one or two playoff appearances and never made the Championship game. The Huskies went 3-8 in 2000. UConn followed with 2-9 in 2001. In 2002 they had their breakthrough season going 6-6 with wins over Navy and and Iowa State. Mark Snyder of the Detroit Free Press previews Michigan's schedule. UConn names their 2012 Captains: Adam Masters, Jory Johnson, Nick Williams and Blidi Wreh-Wilson. Lyle McCombs becomes a dominate force. 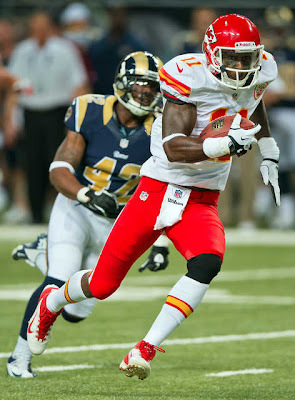 Jeremy Horne was cut by the Chiefs. Travis Tripucka was cut by the Rams. Emil Igwenagu survived the first round of cuts by the Eagles. The article has some quotes by Emil. The Indiana Blog "Crimson Quarry" looks at the Hoosiers offensive line. First off, UMass is rejuvenating their Facebook and Twitter presence. Matty V. has a story about UMass fan's hope for a special year. Meanwhile in Storrs, UConn Coach Pasqualoni is talking up the UMass game. Huskie QB Chandler Whitmer is ready for his chance in the spotlight. UConn's defense thinks they have the potential to be a top-5 unit ---- in the nation. The Detriot Sports Site looks at Michigan's predicts Michigan's wins and losses this season. The MAC Conference has seven head coaches who are in the first or second year with the team. Kent State opens with CAA team Towson. The Tigers are no longer the CAA's doormat. Phil Steele has Towson as the #8 FCS team in the nation. This should be an interesting game to keep track of. The Golden Flashes went 5-7 last year, but two of their losses were to Alabama and Kansas State. The MAC Blog "Hustle Belt" has the conference's Week #1 schedule. Everybody is wondering how Temple will fare in the Big East. ESPN's NFC East Blog rates Victor Cruz the division's 10th ranked player. Stripe Hype breaks down the Bengals battle at the safety position. Brandon London was among six Alouettes players who took part in a charity walk against ALS. MassLive's Harry Plumer has a feature on Coach Molnar's full speed ahead life. Plumer also says UMass' preparation has turned to UConn. UMass linebackers Tim Brandt and Tom Brandt are the focus of this article from the Herald News. The Worcester Telegram says the Minutemen are looking to make a big splash. The Hartford Courant features UMass Head Trainer Jennifer Brodeur. Jennifer's UMass bio. UConn has it's Game Day info up including roster and depth chart. Torrington's Register-Citizen says the Huskies senior-laden defense is looking for a big year. The Greeewich Times says it's a make-or-break year for UConn. A Bleacher Report writer says Lyle McCombs will run through the Big East. CBS Sports have three team records that will fall for UConn this year. Roster cuts are looming for the Rams. A UMass fan took in the Cowboys-Rams game and sent us these images of Travis Tripucka. Thanks! Click on images for a larger view. CBS Sports predicts Josh Samuda will make the Dolphins roster. Our season tickets came in the mail yesterday. Western Mass season ticket holders have an opportunity for bus service from McGuirk to Gillette as per the following e-mail I received. As many of you may know, UMass Athletics has teamed with Worldtek Travel Management to provide round trip transportation between Amherst and Gillette Stadium for football home games. Buses will depart campus 3 hours prior to game time and will return immediately following each game. Please visit https://ems.resrunner.com/umassfootball or call Worldtek at 1-800-879-6176 to purchase your transportation today. CBS Sports has a best-case, worse-case scenario for Vanderbilt. Both cases assume a win over UMass. Vandy may drop its game against Ohio State next year to open with a SEC game. After a year off, UConn WR Michael Smith is back on the team. Michigan is still trying to move their 2013 game against the Huskies to MetLife. LaRon Landry will not be fined for his big hit on Victor Cruz. Michigan makes $7.1 million per game at the Big House----- and that's before concessions. If I remember right a Coke was $5 from a soda guy. 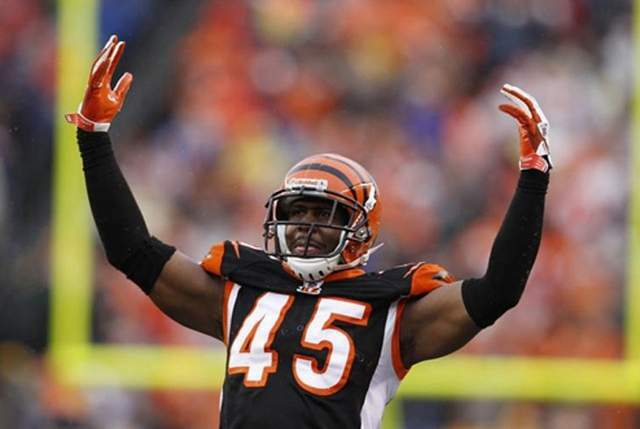 Jeromy Miles draws praise for Bengal's coach Marvin Lewis. Where we were: Phil Steele's FCS Top 40. BTW, the CAA has asked Rhode Island not to drop to Northeast Conference. Matty V. has a story about Massachusetts Lt. Governor Tim Murry's visit with the team . In many states, the state university moving to FBS would be a state holiday, but we have to be glad with what we get. In contrast: an Oklahoma kinder-gardener is told by his school administrators that he can't wear a Michigan sweatshirt because they only allow Oklahoma or Oklahoma State gear. 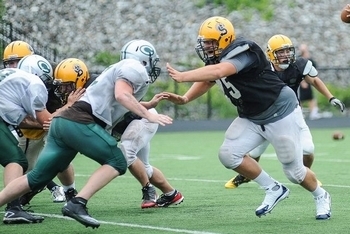 Harry Plumer of MassLive has another "sorta" depth chart article. East Coast Bias offers a not very insightful preview of the UMass-UConn game. Sports Chat Place says Lyle McCombs will run all over the UMass defense. BTW, turn your speakers off. Desmond Connor does a better job for the Hartford Courant. Note that UConn Coach Paul Pasqualoni continues to say positive things about UMass. An annual UMass-UConn game would be great for New England and the fans of both schools. It just makes sense. Hopefully, both schools AD's will make it happen. The UMass Medical School employees get some freebies. The MAC Blog "Hustle Belt" readers pick UMass to go 0-8 in their first season in the league. The MAC Daily looks at Akron--- new coach, new attitude. Ohio loses preseason All-Conference Travis Carrie for the season. 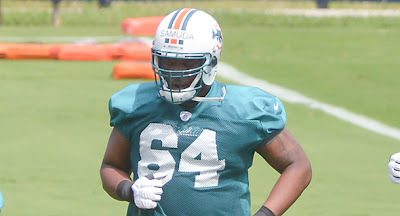 Josh Samuda gets the rookie treatment from the Dolphins veterans (hear end of the article). 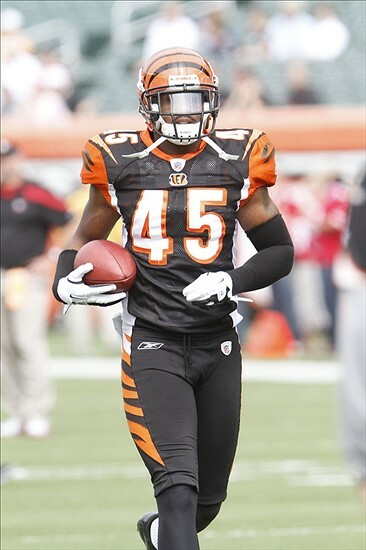 Jeromy Miles is making a strong push to be the starting safety for the Bengals. Stories here and here. UPDATE: The 2012 roster is up. UPDATE II: Ahhh, maybe somebody from football needs to compare notes with whoever is working on the roster. It does not list Blake Lucas or Rob O'Connor and most of the recruits and transfers have no bios. Matty V. has a post on UMass' depth chart for the UConn game. The following is a cut-and-past from part of the article with links added by me. QB- Mike Wegzyn - A.J. Doyle will back him up. WR - Deion Walker and Tajae Sharpe are still battling a bit to see who'll start, but both will play. WR - Marken Michel - No surprise here. RB - Chris Burns, Michael Cox and Jamar Smith are all in the mix to play at running back, which one will start has yet to be determined. "Jamar Smith has really come on in the last couple of days," Molnar said. "He put himself in the competition. He deserves to have a shot to run out there for the first snaps against UConn." Tackle - Nick Speller, Jamie Cassleberry and Stephane Milhim will all play tackle, which ones will start is uncertain. Guards - If Milhim doesn't start at tackle, he'll start at guard. John Wallace and Michael Boland are competing for the other. Both will play. "We're rotating eight guys for the four spots on the defensive line. The four healthiest guys will probably start," Molnar said. DE - Stanley Andre, Ryan DeLaire, Kevin Byrne, Brandon Potvin will all see the field in some rotation. DT - Chaz Thompson, Galen Clemons, Hafis Williams and Daniel Maynes - Same as at end. LB - Perry McIntyre, Tom Brandt, Greg Hilliard will start. - Tim Brandt. D.J. Adeoba. Jovan Santo-Knox. Rob O'Connor, Leo Krizanovic could all see the field. S - Darren Thellen, Christian Birt - Ed Saint-Vil is a likely backup here. CB - Randall Jette and Antoine Tharpe will start. Trey Dudley Giles and D'Metrius Williams will play. "I can see all three of those guys playing." Some surprise missing names: Chad Hunte (58 TT in 2011) and Anthony Dima (11 games played in 2011). Hurt? Eleven transfers or true freshmen mentioned in the above depth chart, if I counted right. NJ.com says Jude Brenya, a 6-3 235 pound DE has verbaled to Old Dominion. Brenya chose Old Dominion over offers from UMass and four FCS schools. One week to the start of FBS football! Matty V. has an interesting story about Coach Molnar's path to UMass. Matty also has a daily run is a necessary part of Coach Molnar's day. Former UMass head coaches Jimmie Reid and Kevin Morris liked to have a daily run. I don't remember if Coach Brown ran. MassLive's Harry Plumer has a feature on Freshman receiver Tajae Sharpe's FBI. NCAA football, no less, has a UMass football preview. They also preview UConn and say the Huskies may contend for the Big East title. iSportsWeb.com says Michigan will steamroll the Minutemen. The Sun Sententile thinks Josh Samuda has made the Miami Dolphins roster. Samuda is the #2 center on the Dolphins depth chart. I've blogged about Sha-Ki Holines before. MassLive has an article that he has decommited to UMass and is now going to UConn. Matty V. has a story on the battle between RSFR John Wallace and true freshman Michael Boland. Note that someone else probably wrote the headline. The Boston Herald says the Minutemen have found their guy at quarterback. The Indiana blog "Crimson Quarry" looks at the Hoosiers' quarterbacks. The Vanderbilt blog "Anchor of Gold" looks at the Commodores offensive line. The MAC blog "Hustle Belt" says Buffalo is losing linebackers at an alarming rate. The Hustle Belt also looks at uniform changes in the MAC this year. The NY Daily New says Victor Cruz was expecting to get drilled by the Jets. The Pats released former UMass kicker Chris Koepplin. Jeromy Miles aims high and stays true to his roots. 9News.com looks at the best offensive players not in a BCS conference and finds a number of them in the MAC. I found a new MAC blog. It's here. Philly.com says UMass has offered to Mike Keir a 6-1 210 pound QB from Roman Catholic HS in PA.
PennLive.com has an article featuring Keir. NJ.com says Enoch Asante, a 6-1 260 pound DT from Steinert HS in NJ has verbaled to UMass. I've blogged about Asante before. I've blogged about UMass' offering to Jake Kennedy, 6-4 280 pound OL/DL from Amherst, NH before. The Manchester Union leader says Kennedy has narrowed his choices to Fordham, UMass, UNH and Yale. Matty V. has a story that Mike Wegzyn has been officially named as the starter for UConn. RSFR John Wallace and true freshman Michael Boland are in copetition for the starting role at RG. Harry Plumer of MassLive.com has a story of Coach Molnar discussing the UMass depth chart. He also has a story about Stanley Andre being moved to DE. ESPN has Coach Molnar intrigued by rebuilding UMass. A Bleacher Report writer previews the Big East and has UConn fifth. The Boston Herald has a feature on Irish transfer Michael Cox. Have you seen the new specialty uniforms for Notre Dame? Cox and Hafis Williams were lucky to escape! Wrentham Patch has a short article on RSFR Brandon Howard. Sentinel and Enterprise has a feature on Rob Blanchflower. State College.com has a story on former UMass assistant coach Ted Roof. Brandon London get lots of quotes in this article about the Larks win over Edmonton. CBS Sports says Jeromy Miles may have Bengals safety Taylor Mays feeling the heat. 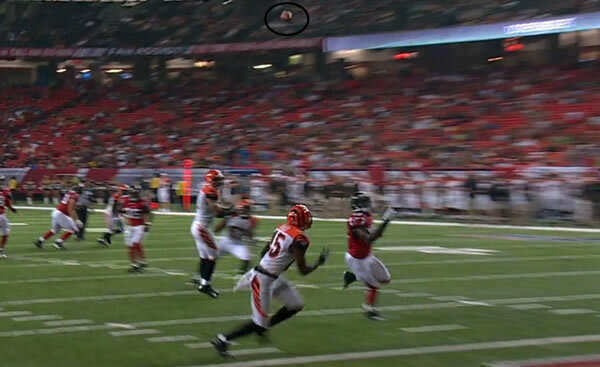 More on Miles' INT here. SB Nation looks at the betting odds in the MAC for 2012. Why Indiana is thinking bigger this year. Fans. Ya gotta love 'em. Why Michigan is Rose Bowl bound. Why Michigan won't even make Alabama break into a sweat. Remember to watch Emil Igwenagu and James Ihedigbo when New England and Philadelphia play tonight. TC Palm says UMass has offered to Shelvick Henry, a 6-0 160 pound CB from Sebastian River HS in FL. This article has a recruiting capsule on Henry. MassLive's Harry Plumer has a story about the Minutemen's defensive line. The "starters" are Chaz Thompson and Galen Clemons at DT with the DE's as Kevin Byrne and Stanley Andre. Also seeing playing time will be Hafis Williams, Brandon Potvin, Ryan Delaire, Daniel Maynes, Trey Seals and possibly Robert Kitching. The Berkshire Eagle says UMass has many options in the offensive backfield this year. The Associated Press says sophomores will play key roles for the UConn Huskies this year. The Boston Globe has a story about Emil Igwenagu looking to get his wings for the Eagles. The Worcester Telegram has a story about Emil catching the eye of the Eagles. SB Nation has a story about the retirement of Boston College's AD Gene DeFilippo and reaction from Eagle bloggers. 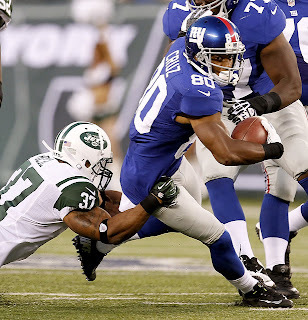 Victor Cruz took a big hit from LaRon Landry last night in the Giants win over the Jets. It was a miserable night for the Jets, who basically had nothing on offense or defensive. Vlad Ducasse played the entire second half and seemed to play pretty good. I did not see Julian Talley get in the game for the Giants. Jeremy Horne caught a 37-yard TD for the Chiefs in their 37-17 loss to St. Louis yesterday. Matty V. has a report on the Minuteman's latest scrimmage. Mentioned are Alan Williams at both RB and WR. True Freshman Tajae Sharpe drew praise from Molnar. The UMass kicking game was one of the weakest (except for kick returning) units in 2011. The Minutemen finished at or near the bottom of the league in field goal percentage (last), PA percentage (10th) and punting average (8th). Matty V reports that true Freshman Blake Lucas is neck and neck with Brandon Levengood for kicking. Jeff Strait is competing with JUCO Colter Johnson. Coach Molnar mentioned Antoine Tharpe, Brian Dowling, Mike Cox, Jamar Smith and true Freshman Stacey Bedell as returners. Emil Igwenagu is in his own position battle in the Eagles preseason camp. Micah Taylor writes for Yahoo Sports how UMass became the Minutemen. SNY will televise the UMass-UConn game August 30th. Temple thinks they'll do better in the Big East the second time around. NorthJersey.com says Victor Cruz is hoping for another big day against the Jets. The Republic reports Cruz and the Jets have a history. Brandon London had four catches for 91 yards against the Eskimos last night. If you haven't seen the new UMass video, you need to see this. Turn your computer speakers up. It's a custom mix by DJ Steve Porter. Matty V. says RB Chris Burns is finally going to get his chance. Yahoo sports writer Taurus Londono remembers UMass football legends. Harry Plumber of MassLive has an article on some unique training methods used by UMass DB coach Jeff Burns. MAC Conference-mate Central Michigan is also going all-black. CBS Sports thinks UConn has had mediocre recruiting results so far in 2012. Victor was among the Giants who made a point of greeting the family of a Colorado shooting victum recently. The NY it might be Round 2 when Victor Cruz faces off with Darrell Revis Saturday. CBS also has a best-case, worst-case season for Indiana football. Vanderbilt, on the other hand, is on a recruiting roll. Jeromy Miles had a nice INT during the Bengals game against the Falcons. First off, thanks to the UMass Media Relations Office for allowing me to attend! A lot of organizations would not be as accommodating------just because. Congrats to John Sinnett on his baby daughter! UMass was in it's new maroon home uniforms. John Sinnett said that the other two versions (the all-black and road whites) have not yet been delivered. Click on any of the images below and Blogger will display the full-rez version. The new all-black helmets were available. If you have never had a chance to talk with the UMass players, they are articulate kids. The players patently responded to press questions. The printed Media Guide is still a work in progress. Many of the players were not listed. One interesting tidbit from the material stated UMass will have live streaming video from Gillette for $9.95 month and $79.95 for the year. I've set up a Picasa web album with 33 images from the event. The link is here. The UMass website has video and an article from yesterday's Media Day. Matty V. has an article on the new UMass uniforms. Three jerseys: maroon, black and White with three pants of the same colors will give the Minutemen nine combinations. MassLive also has an article on the new unis. The Boston Herald says the Minutemen are handing the offense off to Mike Wegzyn. The Berkshire Eagle says UMass is ready to go. Bowling Green DT Ted Ouellet is looking forward to playing in Gillette stadium. Preegame.com looks at the MAC East and has odds and predictions. A Bleacher Report article predicts Ohio will win the MAC title. A Bleacher Report writer predicts one division of the Big Ten. He thinks Indiana will finish 6th with three wins. This Boston Herald article mentions Chris Koepplin. UConn had its Media Day Tuesday. Report here. ESPN New York says Victor Cruz can't wait to see the Jets again . I was able to attend the UMass Media Day this afternoon. I hope to have a image gallery up by sometime tomorrow. Matty V. has a story about the UMass receivers at this stage of training camp. Bob Blanchflower would be top TE. Redshirt Freshman Brandon Howard and Freshman 6-4 Derek Beck has been moved to TE from WR. The article states that Marken Michel, Deion Walker and Brian Dowling are the staring receivers. I would speculate that Michel is the "X", Walker is the "Y" and Dowling would the slot or "Z". True Freshman Tajae Sharpe and Bernard Davis are next in the depth chart. Harry Plumer of MassLive also has a feature on the UMass receivers. A Bleacher Report writer has "20 college teams whose season might be over by week #3". UMass OOC opponents UConn and Vanderbilt make the list. If a UMass fan from Connecticut wants to scout the Huskies for us, UConn will be holding open practices this week. Speaking for closed practices and football paranoia, the Wall Street Journal has a amusing article on the phenomenon. Football Scoop has an article featuring our conference-mate Ball State on the culture shock freshman go through. "Freshman are always in shock no matter where you are, wherever you are in the country. They always think that they lift hard...they don't. They always think they run hard...they don't"
The Giants Blog "Big Blue Review" lives up to its name by reviewing Victor Cruz's book. The CTPost reports that UConn FB Mike Osiecki has left the team.